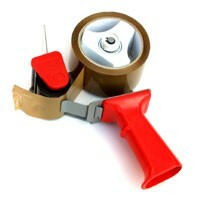 Moving Ahead Services offers tape guns to aid you during your move. Our metal tape gun is designed to dispense any industrial tape with ease so that you can enjoy a smooth packing process. Using a tape gun is typically simpler and quicker than manually pulling tape from a roll, saving you a lot of unnecessary time and frustration. A tape gun makes it easy to dispense proper portions of tape so that you are not wasting it or using too little to make things stick. When you merely pull tape from a roll, you can get pieces stuck on your fingers or inadvertently twist the tape around so that it is no longer effective. With a tape gun, however, you can just slide the tape along the surface of your box or other item until proper coverage has been applied. Our tape gun allows for comfortable gripping and the tape that comes with it is strong and sticky. We do recommend that you employ our packing services so that our professionally trained movers can use the tape gun as efficiently as possible, as they know how to apply tape so that it will offer utmost security for your items. We offer tape guns for affordable prices that you won’t find in most stores and tape guns are included in all of our available supply kits. 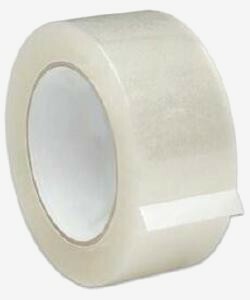 We also provide rolls of industrial tape so that if you already have our tape gun but need more tape, you can simply order more tape without having to purchase a whole new tape gun. If you do use a tape gun to pack your items, you will more than likely find the process to be much less stressful than it normally would be, so be sure to purchase a tape gun while they are in stock.